I’ve often told my students that the best problem solvers are those who recognize patterns from past problems in new situations. So, the best way to become a better problem solver is to solve lots of problems, study the ways others have solved the problems you’ve already cracked (or at least attempted), and to keep pushing your boundaries because you never know what parts of what you learn may end up providing unexpected future insights. Write the numbers 1 though 10 on the board. Pick any two numbers, erase them, and replace them with the single number given by their sum plus their product. (So, if you choose to erase the numbers a and b, replace them with a + b + ab .) You now have nine numbers on the board. Do this again: Pick any two numbers, erase them, and replace them with their sum plus product. You now have eight numbers on the board. Do this seven more times until you have a single number on the board. Why do all who play this game end up with the same single number at the end? What is that final number? SOLUTION ALERT: Don’t read any further if you want to solve this yourself. I started small and general. If the first two numbers (a and b) produce , then adding c to the original list gives which can be rewritten as . That’s when the intuition struck. Notice that the rewritten form is the sum of every individual number in the list, AND every possible pair of those numbers, AND concludes with the product of the three numbers. I’ve seen that pattern before! Where the sign of the final term is positive for even n and negative for odd n. I saw this in many algebra textbooks when I started teaching over 20 years ago, but haven’t encountered it lately. Then again, I haven’t been looking for it. Here’s the point … other than the alternating signs, the coefficients of the expanded polynomial are exactly identical to the sums I was getting from Jim’s problem. 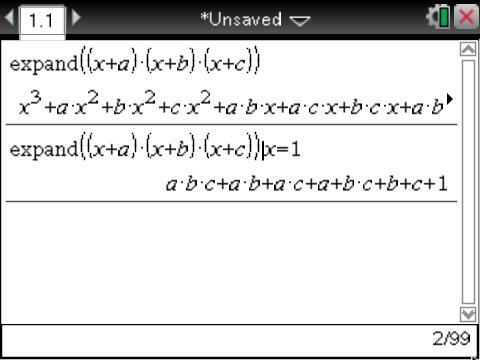 That’s when I rewrote my original problem on my CAS to and expanded it (see line 1 below). The coefficients of are the individual numbers, the coefficients of are all the pair-wise combinations, and the constant term drifting off the end of the line is . And I eliminated the sign challenge by individually adding the numbers instead of subtracting them as I had in the polynomial root example that inspired my insight. Let to clean up and make the pattern more obvious. 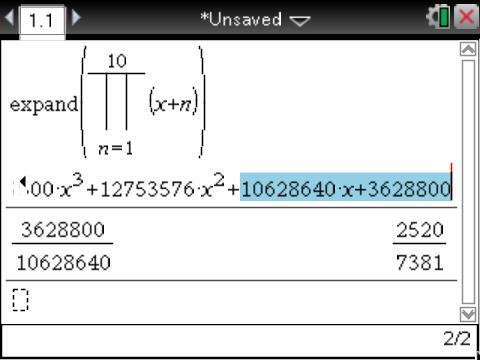 So, creating a polynomial with the given numbers and substituting will create a number one more than the sum I wanted (note the extra +1 resulting from the coefficient of ). Using pi notation, substituting , and subtracting 1 gives the answer. In case you didn’t know, pi notation works exactly the same as sigma notation, but you multiply the terms instead of adding them. The solution–39,916,799–is surprisingly large given the initial problem statement, and while my CAS use confirmed my intuition and effortlessly crunched the numbers, its tendency to multiply numbers whenever encountered has actually hidden something pretty. From the top line of the last image, substituting would have created the product which the penultimate line computed to be 39916800. But before the product, that number was , making a far more revealing version of the solution. MORAL: Even after you have an answer, take some time to review what has happened to give yourself a chance to learn even more. EXTENSION 1: Instead of 1 to 10 as the initial numbers, what if the list went from 1 to any positive integer n? Prove that the final number on the board is . EXTENSION 2: While a positive integer sequence starting at 1 (or 0) produces a nice factorial in the answer, this approach can be used with any number list. For example, follow Jim’s rules with 37, 5, -2, and 7.9. 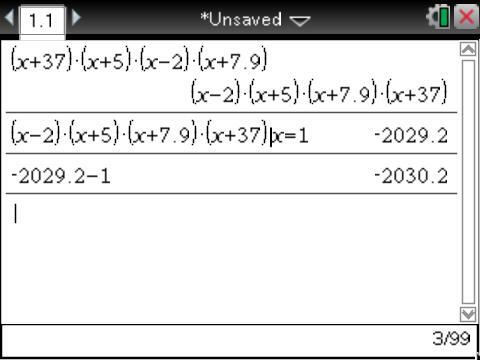 Use the polynomial approach below for a quick solution of -2030.2. Confirm using the original rules if you need. EXTENSION 3: By now it should be obvious that any list of numbers can be used in this problem. Prove that every list of numbers which includes -1 has the same solution. EXTENSION 4: Before explaining some lovely extensions of problems like this to generalized commutativity and associativity, Jim’s May 12 Cool Math Newsletter asks what would happen if instead of , the rule for combining a and b was . You can show that with three terms, this would become , and four terms would give . In other words, this rule would morph n original numbers into a fraction whose numerator is the product of the numbers and whose denominator is the sum of all possible products of any (n-1)-sized groups of those numbers. For the original integers 1 to 10, I know the numerator and denominator terms are the last two coefficients in a polynomial expansion. The final fraction simplifies, but I think is slightly more informative. Happy thoughts, problems, solutions, and connections to you all. I mentioned in a post from earlier this month that I thought Blokus was one of the greatest games around for young and old. Blokus is particularly phenomenal not because of the game’s published rules, but because its simplicity and flexibility allow the creation of many games-within-a-game. 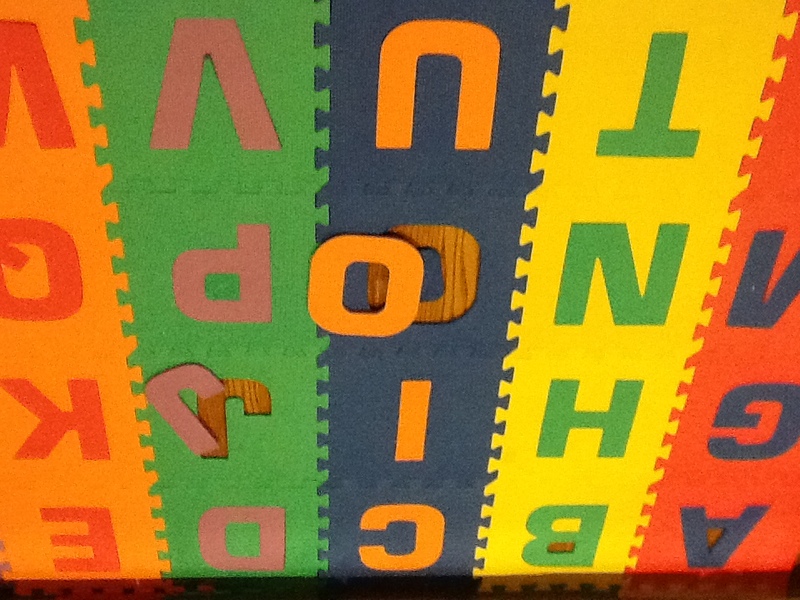 In short, Blokus encourages creativity and allows the space for that to happen. Here are some of the ways I’ve used/played Blokus successfully with my young daughters, my high school students, and with adult friends and colleagues. I’ve ranked my suggested extensions according to how I think young learners would be able to handle them. Just because I list something as challenging certainly doesn’t mean it is beyond any learner. PLAY and maybe you’ll accidentally learn something! First, the game as described in the Blokus rules is just phenomenal. If you never try any of my extensions, the game is worth it. I started Blokus with my oldest daughter when she was 4 or 5 years old. My philosophy of learning-play has been to give my children as much of the “rules” as they can understand and then let them decide how they want to play. My eldest wasn’t interested in the game I described, but she loved the brightly colored pieces and the freedom it gave her to create geometric designs. No problem. The limited number of pieces and shapes restricted her in a way that coloring and drawing on paper never did. She had to plan her designs to get what she wanted. Learning happened. When we did start playing competitively, it was interesting to help her learn to strategize. Don’t just play, talk about better ways to play. What pieces do you want to play first and which do you want to save for late in the game? She doesn’t always want to talk about strategies, sometimes she simply wants to play–so I adapt. When she does want to talk, we definitely engage in serious, thoughtful, directed, and intentional play. When you glance at the various pieces listed in the Blokus game, I bet many see not much more than different shapes, but there’s some very nice geometry involved. How many shapes can you make from n squares, all connected by their edges, if you were permitted only 1 square? 2 squares? 3? 4? 5? This could be an early exposure to the logic of mathematics of multiple cases. Obviously there is only one way to have one square. There is also only one way to have two squares. While the orientation may change, ultimately all connections of two squares are the same. Three squares? I don’t think it’s that hard to figure out that there are just 2 ways to do this: three in a row–or–in an “L” shape. One way to establish this would be to take a 2-square Blokus piece and a 1-square piece and try arranging them in different patterns until you are satisfied you have all the arrangements. What about 4-square arrangements? Again you could use the 1-, 2-, and 3-square Blokus pieces to discover this answer on your own. I’ll hold this answer to the end of this post in case you want to explore. What about 5-square arrangements? 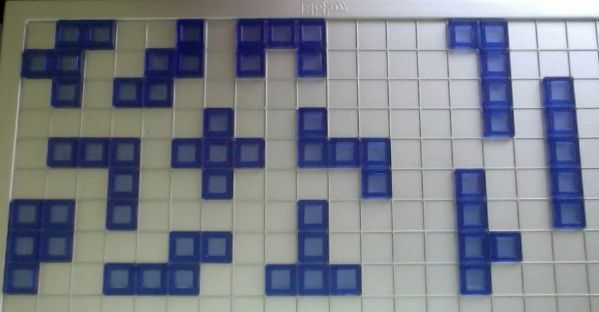 These are called pentominoes, and there are many cool extensions using these. There are 12 unique pentominoes–a factoid I must give away now because it leads to many other games. Whether or not you tell someone there are 12, can you prove that there are only 12? NOTE: Each color in Blokus contains every single possible 1-, 2-, 3-, 4-square, and pentomino arrangement. Cool. A math colleague, LG, once described the goal of the math problem-solving process this way: FIRST, show your answer works. SECOND, show no other answers work. My experiences with most mathematics resources and teaching is that students always deal with LG’s first criterion, but rarely deal with the necessity of the second. The problem of determining the number of unique pieces you can make with a given number of squares requires careful logic to make sure that one has found all solutions and much more importantly, that none are missing. Because there are 12 unique pentominoes, obviously their combined area is 60 units. If you create an 8×8 square grid and exclude any 2×2 square grid from its interior, it is always possible to fill in the remaining 60 units using the 12 pentominoes. The short video below shows a solution to one of these problems. While it seems like there might be many of these “omit a 2×2 square from an 8×8 square and fill in the rest with 12 pentominoes” puzzles, in reality, there are surprisingly few. Using rotational and reflection symmetries, I’m convinced there are only 10 unique such puzzles. Can you or one of your learners prove this? Given that there are only 10 of these fill-in puzzles, how many unique solutions are there to each? I don’t know the answer to this question. In researching for this post, I encountered another interesting puzzle (link in the next bullet). In short, the total area of the pentominoes, 60, is equivalent to 6×10, 5×12, 4×15, and 3×20. Use the 12 unique pentominoes to fill a rectangle defined by each of these four dimensions. Even though 60=2×30, explain why it isn’t worth trying to use pentominoes to fill a 2×30 rectangle. 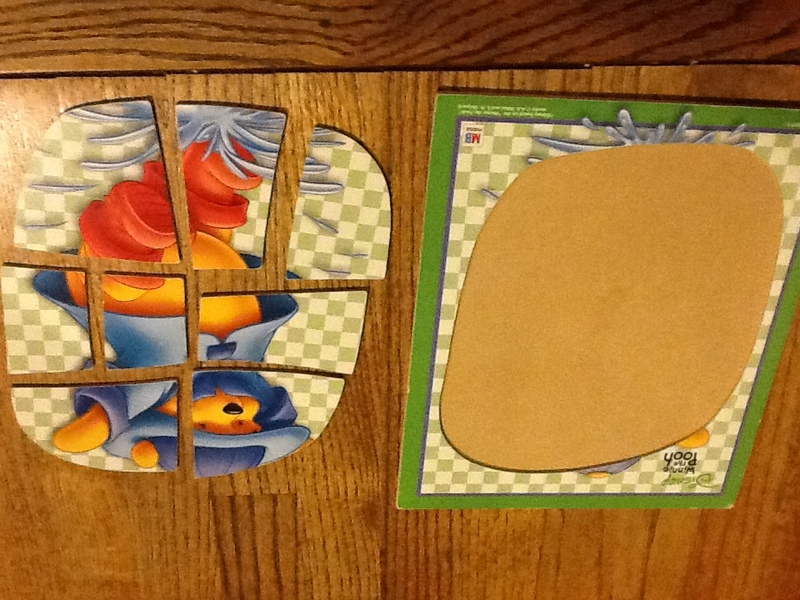 The last puzzle is nice, but going back to LG’s admonition, how do you know you’ve found all possible solutions? This is a very hard problem to do and likely requires a computer search according to the Tiling Rectangles section in this article. I’m hoping these examples have convinced you that Blokus has the potential to be so much more than just a box game. Be creative. Explore. Maybe you’ll accidentally learn something. Most of all, HAVE FUN!!! This next image shows the singleton solutions for the 1- and 2-square arrangements (yellow) and the two 3-square (green) arrangements described above. There are five 3-square arrangements. There are several ways to create convincing logical arguments that all arrangements have been found. My personal approach was to imagine arrangements (from left to right in the red) with all four in a row, then with three in a row, and finally with no more than two in a row. I mentioned earlier that there are 12 pentominoes. The image below shows them all. How can you extend my logic from the 4-square pieces to account for all of the pentominoes? All of this makes me wonder if there is a numerical pattern lurking here. If there is 1 1-square piece, 1 2-square piece, 2 3-square pieces, 5 4-square pieces, and 12 5-square pieces, how many n-square arrangements would there be? Right now, I don’t know the answer. Early in my teaching career, I was introduced to the Farey Series by the amazing Henry Pollak at a month-long 1993 Woodrow Wilson Leadership Program in Mathematics on the Mathematics of Change at Princeton University. I’ve inspired many (elementary school to college-level) students over the years with the following simple-to-understand mathematical nugget. It’s been an especially GREAT HOOK for student athletes and sports fans. Here’s a simple illustration of how I believe Henry introduced these to us almost 20 years ago. Let’s say a softball player’s a batting average for the season is 0.387. How many official at-bats has she had? A quick-and-dirty response notes from which you could conclude that she has 387 hits in 1000 at-bats. That’s certainly a valid answer, but isn’t 1000 at-bats an unrealistically large number for one season? It also ignores the reality the 0.387 is quite likely a rounded or truncated number. So how can you answer this question when you’re not even sure how much you have of the number you’re approximating? It’s much simpler than you might think. It remains higher than the target 0.387. Notice that each time I added the bounding fractions “the wrong way” to get a new fraction between the original bounds, and this new fraction became either my new upper bound or my new lower bound, and then I repeated the algorithm getting ever closer to my target value of 0.387. Doing this one more time gives ! Forget the earlier guess of 1000 at-bats, I now know that a batting average of 0.387 can be accomplished in just 12 hits in 31 at-bats! There are two absolutely amazing (to me) facts about this particular fraction. is the smallest-denominator fraction whose decimal approximation to three places rounds to 0.387, meaning 31 is the absolute minimum number of at-bats for the original problem. 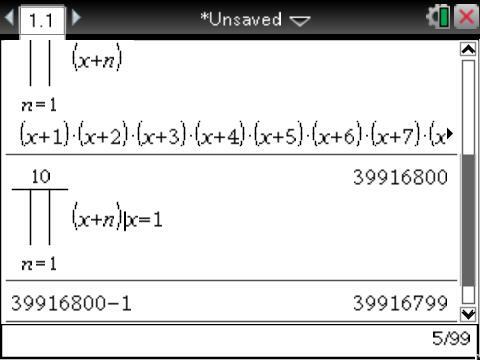 If you continue the procedure, you will get a long sequence of fractions which all round to 0.387, eventually culminating with the fraction , bringing you all the way back to the original guess. This procedure always works. If you’re looking for an interesting math factoid to hook curious individuals from elementary school to adult, this is enough. From a mathematical perspective, such fractions form a portion of the Farey Series, are called mediants (NOT medians), and are sometimes called freshman sums in reference to the way young ones often try to add fractions the wrong way. I was reminded again of Farey Series when I read @benvitale‘s ‘blog post on Approximations of Square Root of 2. He presents these in a different way that I’m certain relies at its core upon Farey series although I haven’t yet taken the time to fully explore it. From a theoretical perspective, there’s lots here for older students who really want to know how a mediant works. Given two fractions where , it’s relatively simple for a student comfortable with algebra and inequalities to show that . That explains how the procedure above quickly narrows the bounds for the target decimal number. The hard part, as I recall, is proving that this procedure leads to the smallest-denominator fraction that rounds to the target decimal number. In my brief research for this post, I also discovered some really interesting paradoxes at the end of the Cut-The-Knot article on mediant fractions. These are absolutely worth reading if you or someone you know adores mathematical surprises. Cut-The-Knot is a great site for lots of cool math facts and ideas. Here are two more ideas for teaching the young I got from interactions with my eldest daughter over the last few days. Maybe some of them will work for you, too. LITERACY: We read to my daughter early and often. We’ve encouraged her to get books from libraries, picked up big stacks (for cheap!) from consignment sales, encouraged her to make up stories to tell us and play with her dolls, and now to write on her own. It doesn’t matter to us how good they are; she should be creative and explore. Very early, she fell in love with the Fancy Nancy books by Jane O’Connor. What we found so cool about the books as parents was that Nancy kept introducing “fancy” words in place of more common words. 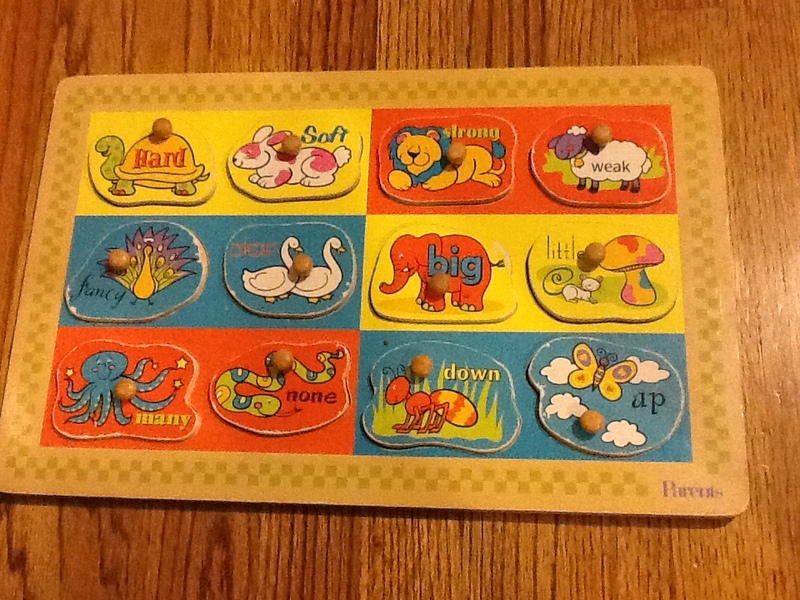 It was great for her early vocabulary, and we jumped on these experiences with Fancy Nancy to promote our eldest’s vocabulary at every opportunity. One example was that whenever we asked her to get something, we requested a “courier.” She started asking us to write the fancy words down for her. Then she started trying to make up some of her own stories. Now she has 100ish MS Word documents (some no longer than a paragraph or two) in my Dropbox folder (so she can pick up her writing from anywhere) of all sorts of stories at different stages. She saw me typesetting some mathematics with MathType and asked me to show her how to do the same. Some of her Word docs are full of nonsensical math symbols. Doesn’t matter. She’s exploring and learning technology and writing. This weekend, she was writing a story and tried to use “inappropriate”. She knew something was wrong because her spelling was underlined in red. By the time she called me over, she somehow had gotten to “inpropriate” and wanted to know how to correctly spell it. Of course, I didn’t tell her. I did point out that there was a “sneaky double p” and I slowly pronounced the word for her. She inserted the extra p beside the first and then tried between the n and p first a u, then an e, and finally an a. I was so psyched that I hadn’t taught her about right clicking and choosing from the dictionary’s suggestions. Here, the word processor identified a misspelling, and my daughter caught it. Rather than jumping to an easy answer, I encouraged her to try different options, to figure the thing out on her own. Obviously, this isn’t a perfect fix. Once she spelled any word correctly (not necessarily the one she intended), the red underline would go away. But that seems like another great learning opportunity for later when she asks me to read her stories or when I ask her to read them to me. I think my next step is to uncheck the autocorrect feature in my word processor! As to other books, Fancy Nancy was one daughter’s delight. Find what fits the children around you. If the kids don’t encounter new words or ideas, keep reading for its own sake, but FIND BIGGER BOOKS! You can see the toy we were using in profile in the 35 second video clip below. She had been playing with the cars’ magnets to pull the train cars together as a unit. Today, I was inspired to show her a couple tricks. After she played with them, she wanted me to film her doing both tricks–that’s the clip below. First, I set two of the cars apart on the track with opposite poles facing each other. When I moved one very slowly close to the other, you should have seen her jump when the untouched train moved “all on its own” to connect with the one I was holding! Then I reversed the car so that the same poles were facing each other. I told her I thought I could move the car without touching it at all! Her eyes were wide open! She spent the next 30 minutes showing everyone in the house her new tricks! I’ve opened the door to magnetic fields. We’ll walk through that one later. Wonder is enough for now. If you are in Atlanta, GA July 9-11, 2012, you might be interested in attending a workshop my co-author and I are offering at Westminster through the Center for Teaching. A description of the workshop follows. We hope to see some of you! Workshop Description: PreCalculus Transformed highlights the under-explored role of non-standard transformations and function composition in learning algebra and precalculus concepts. Families of functions are identified first by immutable distinguishing characteristics and then modified through multiple representations & transformations. Participants will discover that many historically complicated precalculus problems and concepts are both richer and greatly simplified in this process. The course integrates computer algebra system (CAS) technology, but it is certainly possible to use and grasp its concepts without this technology. Potential topics include expanded transformations, polynomials, rational functions, exponentials, logistics, and trigonometric functions. Additional topics may be explored depending on time and participant needs or experience. Textbook is included in the workshop price.